This week I review a product I was very excited to buy, PharMeDoc Total Body Pillow with Jersey Cover billed as The World’s Most Comfortable Maternity / Pregnancy Cushion. My hope was that the pillow would help me sleep on my left side, the preganancy position recommended by doctors despite my natural tendencies to sleep on my back or stomach. I had high hopes that this product would despite requiring me to change a behavior ingrained in me for years and rather quickly. In my mind it would be like when I bought my Saturn years ago. The car was perfect for me in every way but one, it was a manual and I’d never learned how to drive a stick. Undeterred I bought it, had my then boyfriend drive it home for me and in the first lesson I took with a driving instructor felt comfortable with my skills. So, I figured how much harder could it be to use a pillow to learn a new way to sleep. It turns out it was a lot harder. As Matt was home earlier than me and many reviewers both make and female said the pillow was great for their backs I encouraged him to try it out and came home to find him asleep on it, for a promising start. As we’ve both tried it out, I’ll include details from us both. The pillow itself is plush and soft. While normally I like soft pillows both Matt and I felt it was a fit too soft in terms of filling and Matt thought it didn’t give him enough neck support. The pillow didn’t come with any instructions or words of encouragement. I truly wish it had as I wanted advice on best position without having my arm feeling crushed or falling asleep, both of which happened a lot to me. I’m still confused as to how a mom could use it though breastfed a use included in the product description. I repeatedly tried it and often ended up using it between my legs or not at all and still winding up on my back or stomach. Today stressed by insomnia yet again, I put it in my hamper to stay there for at least a few more nights. Matt had said he’d try it again sometime and I will, also, as I get closer to my second trimester. The pillowcase has a zipper which makes for easy removal and cleaning. It seems overall like a sturdy product good for years of sleeping. 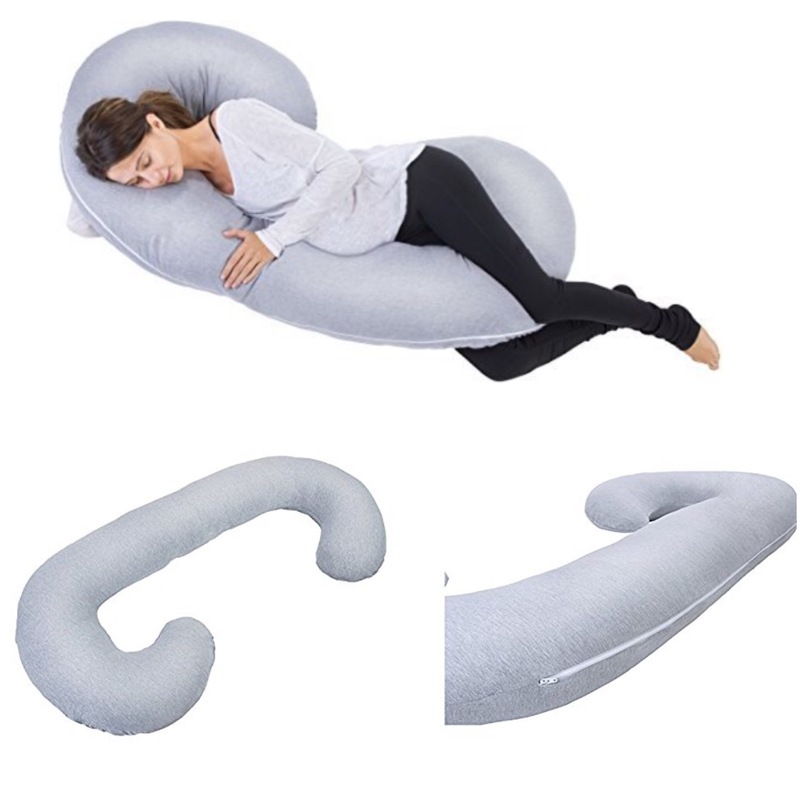 I realize this pillow like a manual transmission may not be for everyone, but I do hope it will work for me as my pregnancy progresses. Danielle – three baby booties out of five and Matt – four baby booties out of five. Combining our ratings gives this a three baby booties out of five overall.